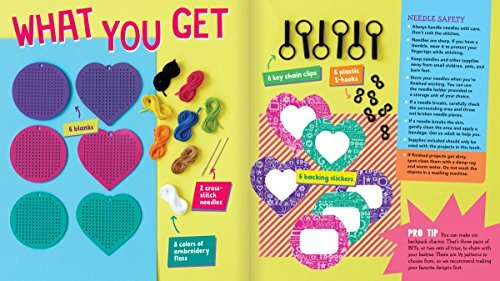 Update: My friend & HCW reader, bought a few of these craft kits for gifts and absolutely loves the quality that she wanted to order more! We found a hot deal on a fun kids Craft Kit on Amazon! This would make a fun birthday gift! Hurry and get the Klutz Bff Backpack Charms today for $19.99 NOW only $5.15 from Amazon! Limit 4. Save BIG! Make one, give one! Cross-stitch six keychains to share with your BFF. Choose from 14 easy-to-follow design patterns to match your friendship. Whether you want to be total twinsies with matching keychains or you’re more of the opposites-attract type, you’ll have plenty of options to create the perfect pair. Wear them loud and proud to show off your bond with your bestie. Buy the Klutz Bff Backpack Charms from Amazon. Previous articleUtz Potato Chips or Party Mix Snacks (Pack of 60) Hot Deal!